Due West Carpentry and Renovations Ltd on the North Shore of Vancouver B.C. is a Highly Recommended Renovation, Remodeling & Restoration Company | BBB Accredited Vancouver Renovation and Home Improvement Restoration and Alteration Construction Business with Efficient and Outstanding Results. Due West Carpentry & Renovations Provides Beautifull Home Improvement Restoration & Renovation Services on the North Shore in Greater Vancouver B.C. including North Vancouver, West Vancouver, Burnaby, Coquitlam, Lions Bay and Port Moody and Whistler. 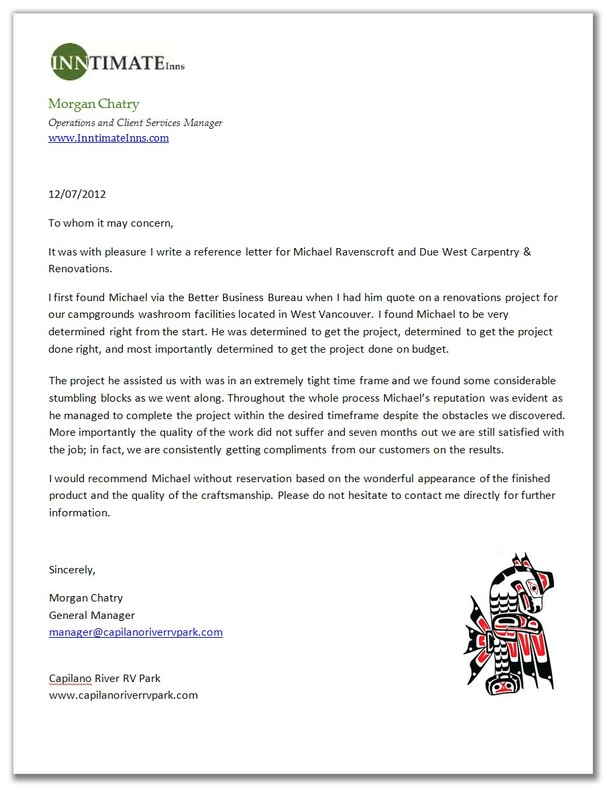 We are happy to provide this letter of recommendation for Michael Ravenscroft, Due West Carpentry & Renovations Ltd.
Due West Carpentry & Renovations Ltd. was hired to renovate the entire exterior of our home, including the gutters and replacing our decks in the summer of 2012. Michael and his team undertook first class work and did not quit until everything we asked for was complete to our satisfaction. Michael conducts himself in a very professional manner and is extremely reliable. We would highly recommend Michael Ravenscroft and Due West to anyone considering a renovation and we will certainly use him again for any of our future projects. 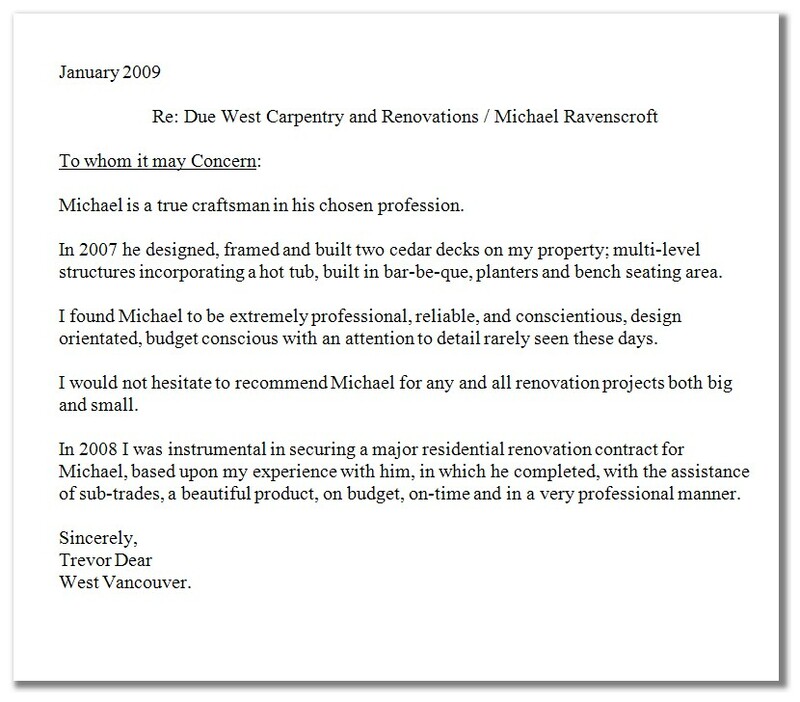 It was with pleasure I write a reference letter for Michael Ravenscroft and Due West Carpentry & Renovations. 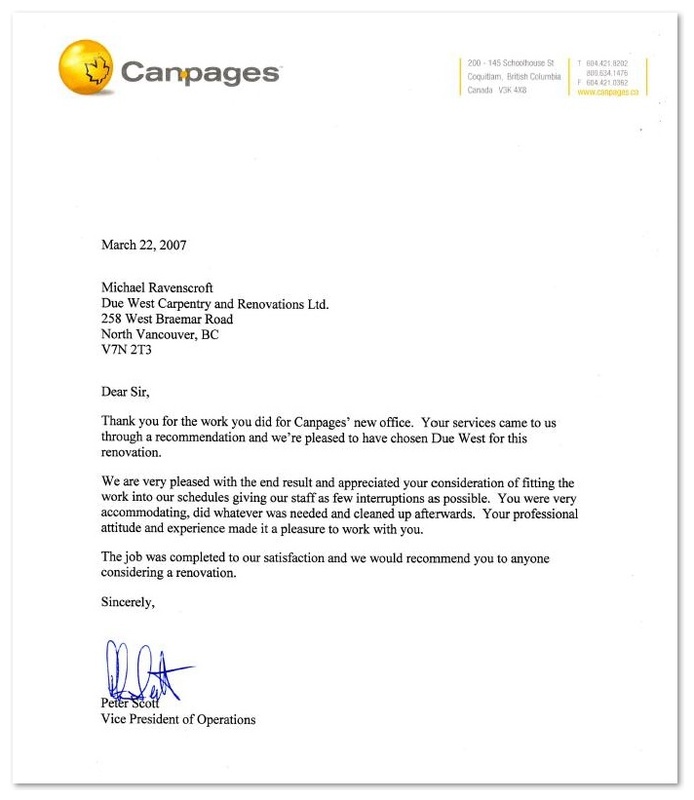 I first found Michael via the Better Business Bureau when I had him quote on a renovations project for our campgrounds washroom facilities located in West Vancouver. I found Michael to be very determined right from the start. He was determined to get the project, determined to get the project done right, and most importantly determined to get the project done on budget. The project he assisted us with was in an extremely tight time frame and we found some considerable stumbling blocks as we went along. Throughout the whole process Michael's reputation was evident as he managed to complete the project within the desired timeframe despite the obstacles we discovered. More importantly the quality of the work did not suffer and seven months out we are still satisfied with the job; in fact, we are consistently getting compliments from our customers on the results. I would recommend Michael without reservation based on the wonderful appearance of the finished product and the quality of the craftsmanship. Please do not hesitate to contact me directly for further information. 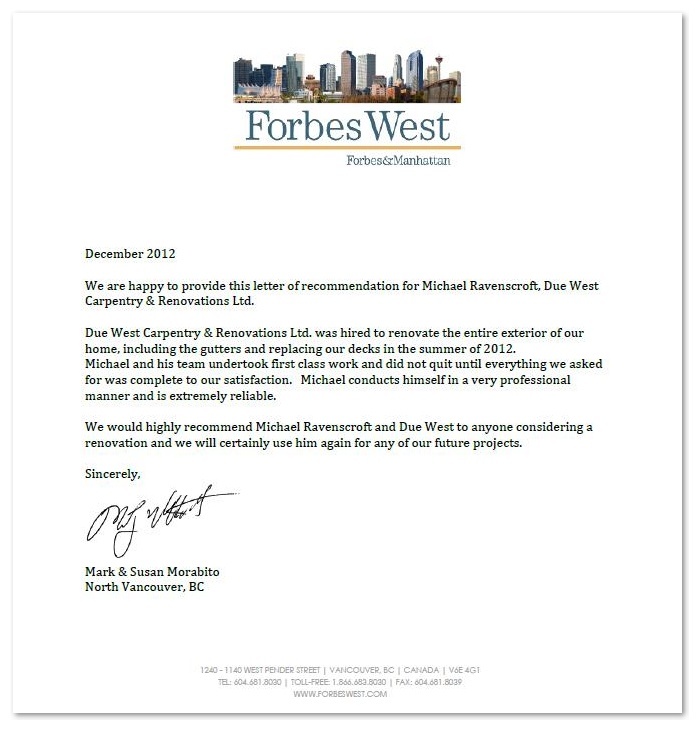 We are happy to provide this letter of recommendation for Michael Ravenscroft. 2. The renovation of our kitchen in 2008. Michael was professional in his approach to providing an accurate scope of work and contract price for both projects. Michael ran his projects very well in coordinating his trades and meeting the schedules. Michael is also a skilled carpenter and was able to complete meticulous finishing work on our cabinetry and moldings in our new kitchen. Throughout the kitchen project Michael was able to provide us with creative ideas to improve the look and function of our new kitchen. Margo and I are very happy with the services provided by Michael Ravenscroft and will certainly use him again for future projects. 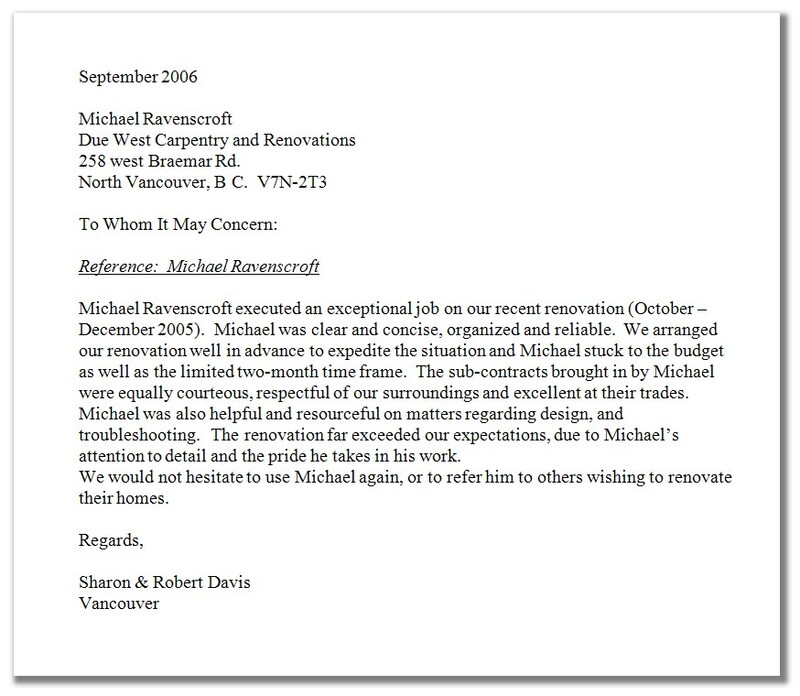 We would also recommend Michael to others for similar home renovation projects. In the summer of 2012 the Michael Ravenscroft and Due West Carpentry was contracted to remove an existing overhead structure covering a patio and to construct a pergola. The project was very well done, on time and on budget. Michael was a real pleasure to work with and his professionalism, skill and ability to work with a homeowner was evident. I would not hesitate to recommend Michael Ravenscroft and Due West Carpentry for a construction job of this type. Michael kept a very neat and organized work site and his skill as a carpenter and contractor were most evident. He was always on time and explained all aspects of the project. We would definitely contract Due West Carpentry for a job of this type as we found the experience enjoyable and are very happy with the final product. If you would like any further information I would be more than willing to talk to any future client. 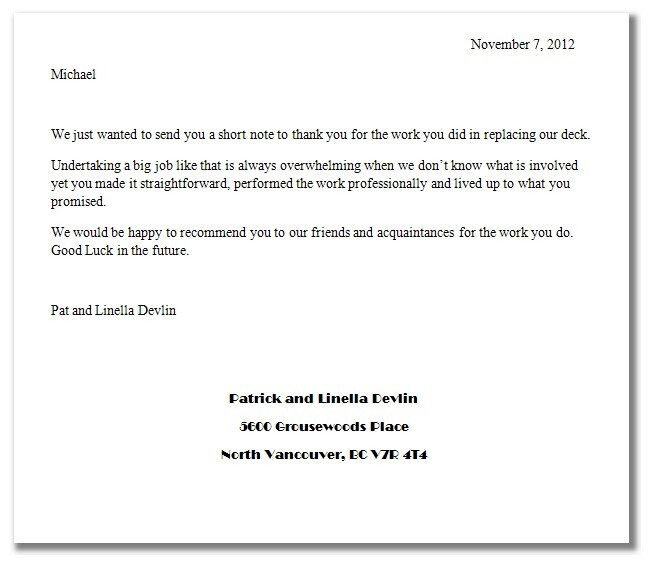 We just wanted to send you a short note to thank you for the work you did in replacing our deck. Undertaking a big job like that is always overwhelming when we don't know what is involved yet you made it straightforward, performed the work professionally and lived up to what you promised. We would be happy to recommend you to our friends and acquaintances for the work you do. Good Luck in the future. I was referred to Michael at Due West by a close friend who had previously contracted Michael for work and was pleased with the end results. In our case it was a major undertaking as it required the total renovation of a home in West Vancouver, that was over 30 years old and the work would have to be handled by the contractor with little or no supervision as we are overseas residents. Michael, rose to the occasion and completed a very difficult, often times complicated project with many surprises that we had not initially anticipated as the house was quite run down from being a long term rental. His workmanship, designing capabilities, sub contractors, honesty and attention to minute details was impressive and the end results have proven to be a first class renovation. I have no reservation in recommending Michael for any projects that he may undertake. Due West Carpentry and Renovations Ltd. Thank you for your work you did for Canpage's New offices. Your services came to us through a recommendation and we're pleased to have chosen Due West for this renovation. We are very pleased with the end result and appreciated your consideration of fitting the work into our schedules giving our staff as few interuption's as possible. You were veryaccommodating, and did what ever was needed. Your professional attitude and experience made it a pleasure to work with you. The job was completed to our satisfaction and we would recommend you to anyone considering a renovation. Michael is a true craftsman in his chosen profession. In 2007 he designed, framed and built two cedar decks on my property; multi-level structures incorporating a hot tub, built in bar-be-que, planters and bench seating area. I found Michael to be extremely professional, reliable, and conscientious, design orientated, budget conscious with an attention to detail rarely seen these days. 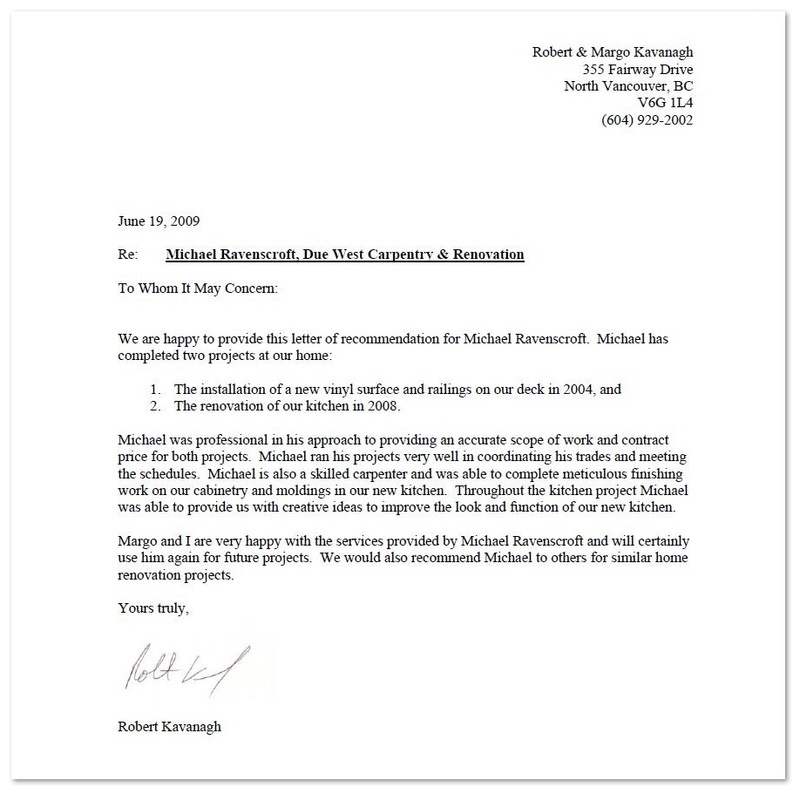 I would not hesitate to recommend Michael for any and all renovation projects both big and small. In 2008 I was instrumental in securing a major residential renovation contract for Michael, based upon my experience in which he completed, with the assistance of sub-trades, a beautiful product, on budget, on-time and in a very professional manner. Due West Carpentry and Renovation's Ltd.
Reference: Michael Ravenscroft Michael Ravenscroft executed an exceptional job on our recent renovation (October December 2005). Michael was clear and concise, organized and reliable. We arranged our renovation well in advance to expedite the situation and Michael stuck to the budget as well as the limited two-month time frame. The sub-contracts brought in by Michael were equally courteous, respectful of our surrounding's and excellent at their trades. Michael was also helpful and resourceful on matters regarding design, and troubleshooting. The renovation far exceeded our expectations, due to Michael's attention to detail and the pride he takes in his work. 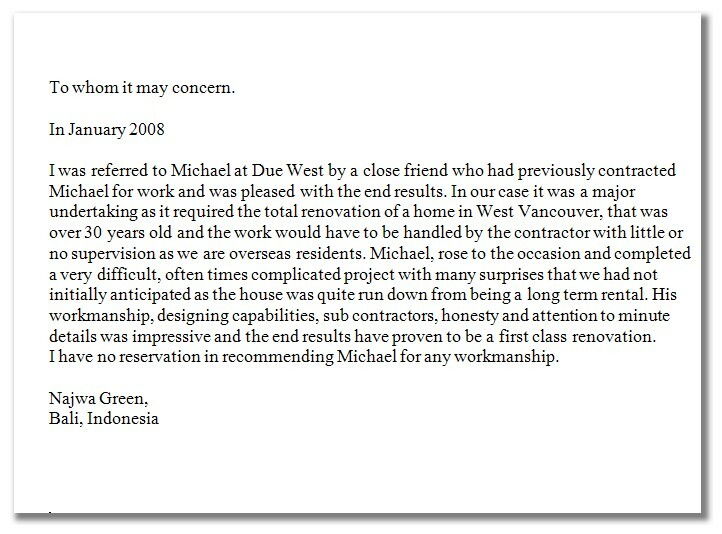 We would not hesitate to use Michael again, or to refer him to others wishing to renovate their homes. 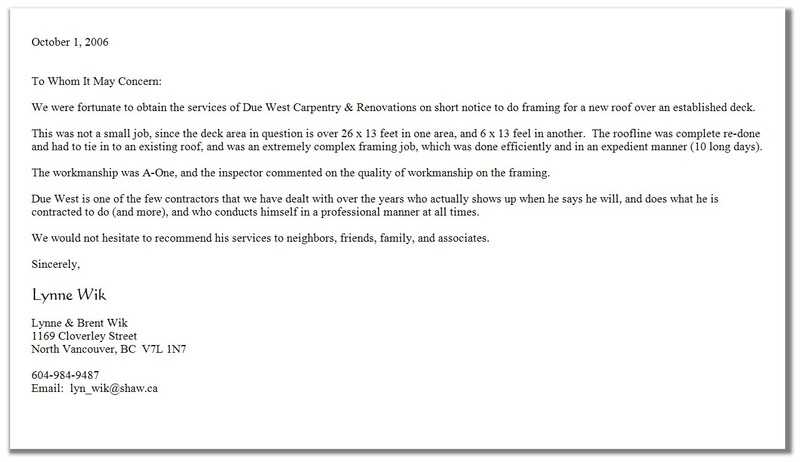 We were fortunate to obtain the services of Due West Carpentry & Renovation's Ltd. on short notice to do framing for a new roof over an established deck. This was not a small job, since the deck area in question is over 26 x 13 feet in one area, and 6 x 13 feel in another. The roofline was complete re-done and had to tie in to an existing roof, and was an extremely complex framing job, which was done efficiently and in an expedient manner (10 long days). The workmanship was A-One, and the inspector commented on the quality of workmanship on the framing. Due West is one of the few contractors that we have dealt with over the years who actually shows up when he says he will, and does what he is contracted to do (and more), and who conducts himself in a professional manner at all times. 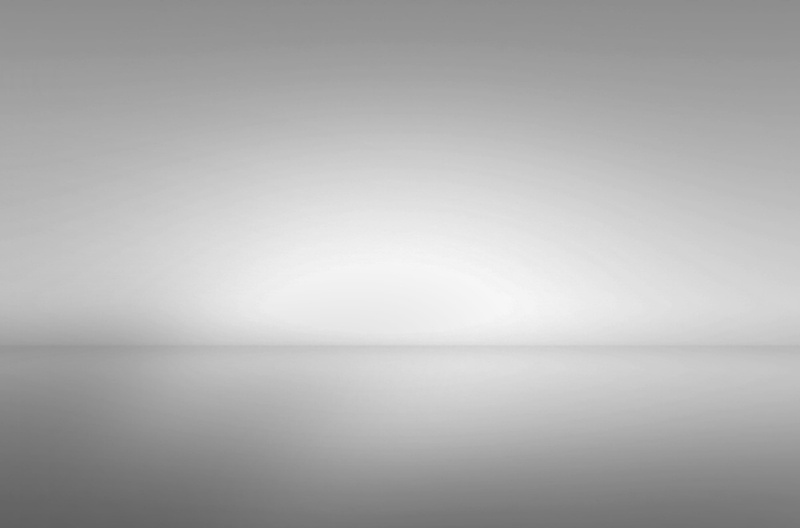 We would not hesitate to recommend his services to neighbors, friends, family, and associates. Thank you for your work you did for Intrawest's North Vancouver office, Intrawest Central Reservations. The job was well done and our management team was very impressed. The new offices, remarked the VP of Sales "did not look like an addition but like an original space, a sign of good workmanship".Your many years of experience were clearly reflected in the work you performed. We appreciated your expertise, professionalism and excellent workers and trades you brought in. It was a pleasure to work with you and I would highly recommend you to anyone considering renovations for their office or residence. 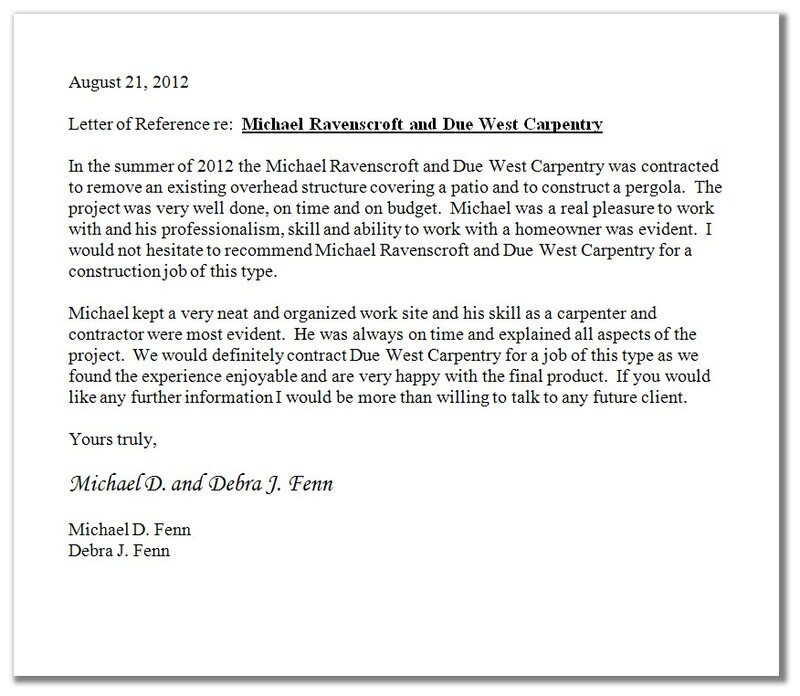 Michael Ravenscroft of Due West Carpentry and General Contracting was hired by us to complete some interior remodeling. We were very pleased with the new interior doors he installed, the fireplace remodeling which included construction alterations, tiling and fireplace surround installation and painting. He also replaced our old steel hand railing with a beautiful banister, which was a combination of white painted spindles and stained and varnished posts and railings, which he created and installed for us. The quality of workmanship was excellent with great attention to detail. He kept a very neat and clean work area and was meticulous in his work. We would highly recommend him and hope to use his services in the future. "Highly Skilled and Highly Recommended"